A new library at Berkeley’s REALM Charter School will be carved out of an existing room in a commercial building. 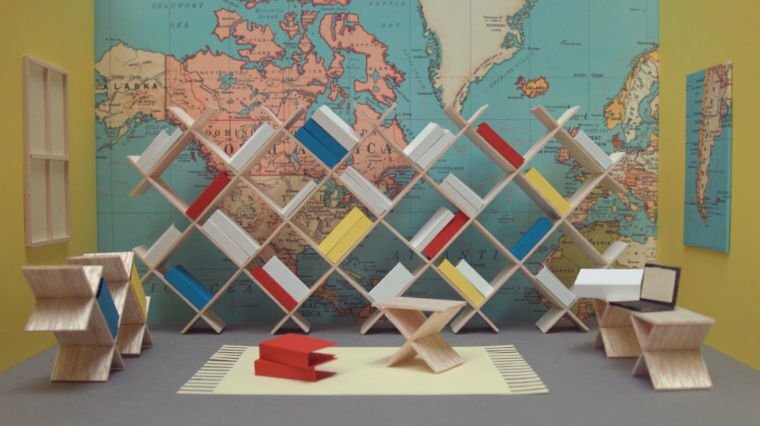 Designed and built by eighth-grade students, it is centered on the concept of X-shaped modules that will create everything from bookshelves to seating. REALM Charter School students assemble X-shaped units made of precision-cut plywood that will form the base of shelving, furniture, fixtures and more. 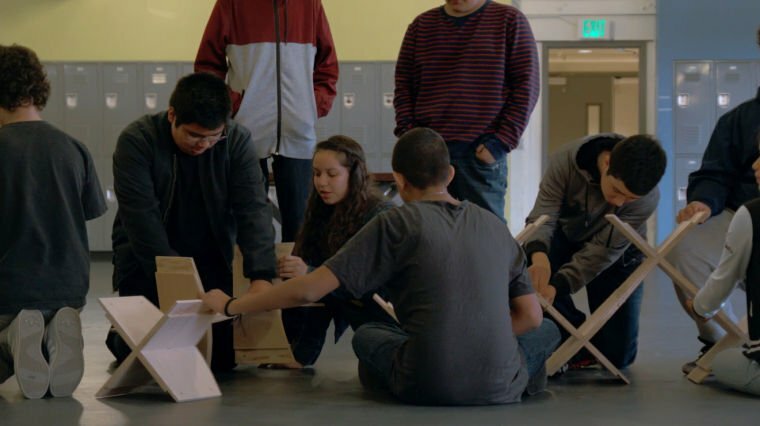 The Berkeley, Calif., eighth graders are designing and building a 21st-century school library. Berkeley, Calif., eighth-graders decided to use an X as their modular building block and are calling their new-fangled library the X-Space. There’s an empty room at the REALM Charter School, which opened three years ago in an existing commercial building in Berkeley, Calif. When Emily Pilloton, director of the school’s Studio H design and build class, and Hallie Chen, an eighth-grade teacher, asked students what they envisioned for the space, they had plenty of ideas. Pilloton’s Studio H program, which teaches kids hands-on design and building skills, has previously empowered high-school students in Bertie County, N.C., to build a community farmer’s market, earning them the key to the city. Now based at REALM, where she recently started a design and building camp for girls, Pilloton is helping lead 108 eighth-grade students on a mission to design and build a 21st-century school library. To get started, they took a field trip to the new public library a half a mile from their school. Pilloton and Chen said they looked for a design strategy that would be both manageable for eighth-graders and logistically possible for 108 students to collaborate on equally. They decided on a building block model, where the crux of the student design work goes into conceiving of one basic module, which can then, like a Lego brick, form the basis of everything in the space, from bookshelves to tables and seating and light fixtures. They eventually decided to use an X as the building block and are calling their new-fangled library the X-Space. The individual units, which they are calling STAX, are made of 13-ply finished plywood. Carl Bass, CEO of Autodesk, helped them to work out the details of the design to make sure the modules would be stable enough to support the weight of books. He volunteered his high-precision computer numerical controlled cutting machine to ensure that each module would be identical, cutting the pieces needed to make the STAX units himself in his private shop nearby. It seems noteworthy that the library project is the last space to be built out in the school, which probably wouldn’t have been the case even 20 years ago. Not to mention that the school has run out of funds for renovation. So to raise the $75,000 needed to build and equip the X-Space, Pilloton and her students launched a Kickstarter campaign that they hope will fund books, construction materials, lighting, fixtures, hardware, technology, software, subscriptions, periodicals and e-books for the X-Space.